The NASA/ESA Solar and Heliospheric Observatory spacecraft captured this view of a small comet (visible as a white streak to the lower right of the sun) plunging toward the sun on Oct. 10, 2013. A doomed comet is diving toward the sun today (Oct. 10) just days after another comet dove headlong into the star — a double-comet death dive that comes six weeks ahead of the much-anticipated solar encounter of yet another icy wanderer: the potentially dazzling Comet ISON. The apparently nameless comet diving into the sun today is probably just 33 feet (10 meters) or so wide, so it has virtually no chance of surviving its close brush with our star, experts say. 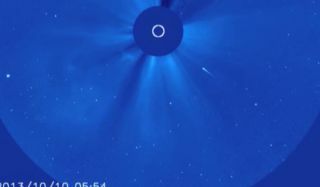 The early stages of the icy object's death plunge have been documented in a new sundiving comet video captured by the Solar and Heliospheric Observatory spacecraft (SOHO), a joint operation of NASA and the European Space Agency. The SOHO spacecraft video above also includes views of another comet, smaller than today's object, which appears to have fallen into the sun on Tuesday (Oct. 8). Comet ISON, on the other hand, is much bigger — likely somewhere between 0.12 miles and 1.2 miles (0.2 and 2 kilometers) wide — and has a pretty good chance of weathering its upcoming solar approach, which will bring the comet within just 730,000 miles (1.2 million km) of the sun's surface on Nov. 28. If ISON emerges from this flyby intact, it could put on a stunning show for skywatchers in early December, scientists say. The tiny comet meeting its doom today is thought to belong to a family of comets known as Kreutz sungrazers. These comets, whose orbits bring them extremely close to the sun, are believed to be the remains of a single giant comet that broke apart several hundred years ago. They're named after the 19th-century German astronomer Heinrich Kreutz, who first demonstrated that such comets are related. Not all sungrazing comets are members of the Kreutz group; Comet ISON, for example, is not related to this family. Scientists and skywatchers alike hope Comet ISON, which was discovered by two amateur astronomers in September 2012, holds together during its close solar encounter. Researchers have organized a global observation campaign, enlisting many different instruments both on the ground and in space, to track the comet's behavior as it nears and then retreats from our star. They hope to learn more about ISON's composition and structure, which could reveal insights about the solar system's early days.